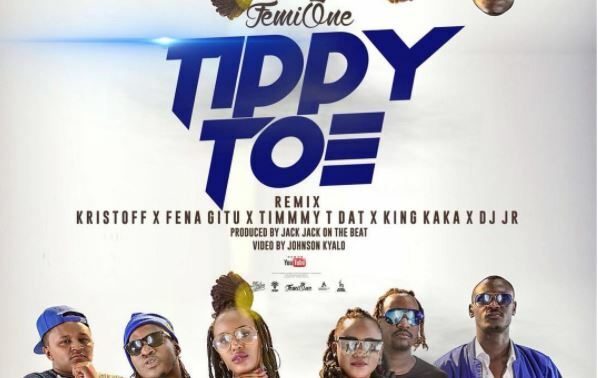 As if Raila and his call for demos wasn’t enough bad news for this country, some Kenyan artists have come together to release a remix of the godawful song ‘Tippy Toe’ by Kristoff and Femi One. When the original was released in January, the only good thing about it was the sick beat by Jack Jack on the beat. Everything else was just a steaming pile of sh*t and that’s my honest personal opinion. I believe the beat could have used better content..not matippy toe for crying out loud. Anyway, the song has its fans and it has been on heavy rotation for months. Its commercial success has culminated in a remix featuring Timmy Tdat, Fena Gitu, King Kaka and DJ Jr. If you ask me, it is still a steaming pile of sh*t but my opinion means little so check it out below. Support Kenyan music they said.